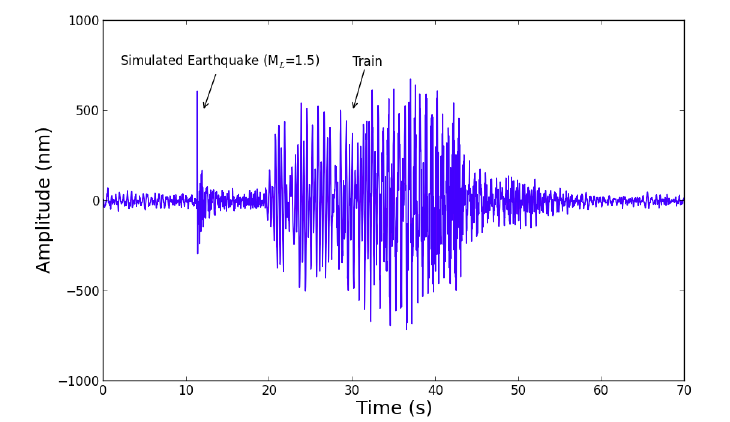 This image compares the vibrations from a passing train, measured at a distance of 150m, to a simulated earthquake occurring 2km below Cuadrilla's Balcombe drilling site (from the Bristol University Balcombe baseline study). We found that the train vibrations had similar amplitude to a magnitude 1.5 earthquake, equivalent to the second quake that lead to the shut down Cuadrilla's operations in Blackpool in 2011 (and a two-year moratorium). So there is a risk that trains passing by could also ovalise the casing? Goodness! The first quake at Preese Hall had a magnitude 2.3. I find it strange that you forgot to mention that. Does that information not suit your thesis? Its just irrelevant. Shale, being a soft rock, cannot generate large earthquakes. For that you need hard rocks that will lock up until they shear. 2.3 is still classed as ' very slight' and to start getting minor damage to buildings you need intensity 5 and above. Each single unit is an order of magnitude difference. When the first Preese Hall event occurred, the nearest monitoring station was approximately 70km away. The amplitude of seismic waves decreases with distance, so the recorded waveforms from the first event are substantially smaller, and a comparison with the train recorded at a distance of 150m would be meaningless. By the time the second event occurred, the BGS had installed a monitoring station fairly close to the well (I forget the exact number, but within a km or two). It makes a lot more sense to plot the waveforms from nearby stations to compare against the train, and that is what I have done.